3D printers are awesome. There’s a catch, though: The printers are nowhere near inexpensive enough for most people to just pick one up. We’ve seen some cheap ones like the Printrbot, but that will still run you up $500. What if you could get one for free, though? Ken, a student at Virginia Commonwealth University, wants to help you get one on the cheap. 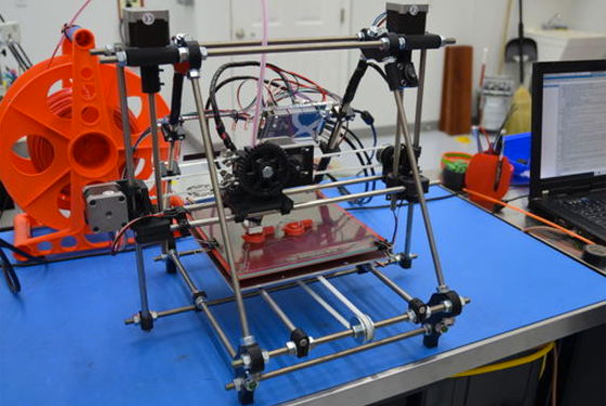 He wants to use an open-source 3D printer called the RepRap (Replicating Rapid Prototyper) to print the parts for other identical machines--thus, more 3D printers. He can’t afford one right now, so he started a Kickstarter to help get the money to make one. They’re designed to be relatively easy to build, and most of the parts needed to build a RepRap 3D printer can be made on another RepRap. You’ll still need to grab some electronics and hardware, but it’s all supposedly incredibly easy to find. You may even have some or all of the materials at home. Ken doesn’t think that there are enough people using the printers the way they were intended--to print the parts for more printers. So he wants to make some--and one for himself of course--and send them out to pledgers. You can then use your RepRap machine to make tons of cool stuff like gears, octopus coat hooks, 3D printers, and other awesome junk! I’ve always wanted a 3D printer, so I hope this catches on so I can get my hands on some printer parts. Until then check him out on Kickstarter and fund him, then send me some parts!